When you’ve been around for over 170 years, you accrue some good stories. For example, you might buck the Law by selling your spirit (legally) during Prohibition, or be privy to a closely guarded recipe you can never share. There might even be a legendary origin if, as company lore tells it, your founder claimed his recipe originated from a Swedish chemist whose entire family lived impossibly far into their hundreds. To hear those tales, you'll have to chat with Count Edoardo Branca, the sixth-generation scion of Fratelli Branca. What Is a Digestif, Anyway? Start with a base of distilled spirit. Add flavoring and sweeteners to it, and that liquor becomes a liqueur. Within liqueurs, you’ll find the class of extremely flavorful, high-ABV liqueurs known as bitters. Amari are an order of Italian bitters -- technically no real difference exists between bitters and amari, but the latter tend to stand alone as their own drink. Amari can be sipped neat, rather than used solely as cocktail additives. In fact, amari are almost universally consumed as digestifs (small, after-dinner drinks). 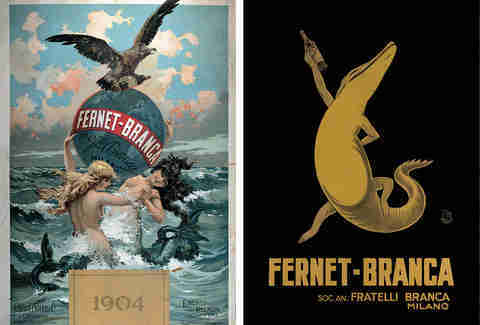 Fernet-Branca is much less sweet than other digestifs and even other amari. 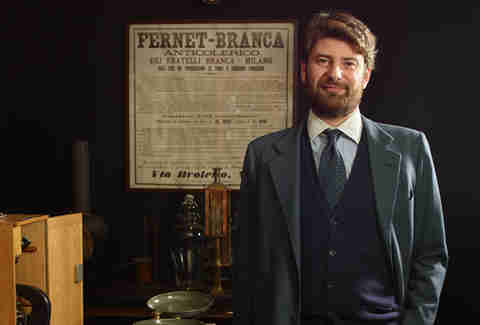 But what goes into Fernet-Branca? That’s the 171-year question. 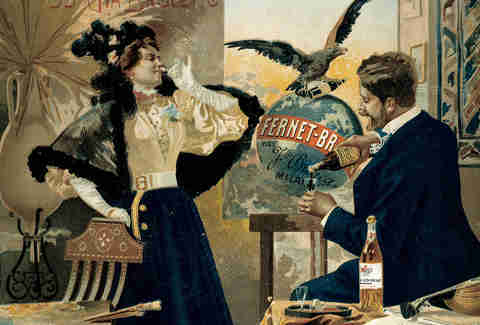 Back in 1845, Bernardino Branca concocted what is in all likelihood the first fernet, so called because he claimed his vitality elixir was the work of a (quite literally) legendary Swedish chemist, Dr. Fernet. Whatever its origins, only the head of Fratelli Branca knows the full recipe. 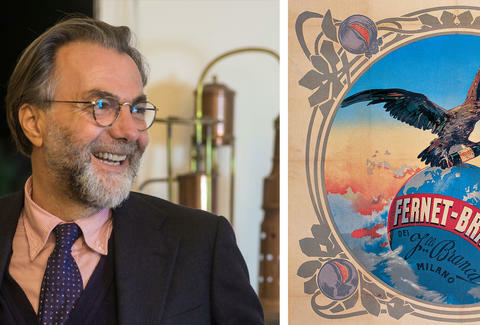 Count Niccolò Branca di Romanico, the current CEO and chairman (and, hey, father of Edoardo), buys many of the ingredients himself, and mixes the five most secret ones in a sealed room. Fratelli Branca continually innovates its technology (but preserves its process) to produce its beloved product in a conscionable way. Since becoming CEO, Niccolò has “tried to put emissions and pollution practically to zero,” says Edoardo, adding that the company is “being certified by the Italian government” for the sustainability measures implemented of its own accord in 2006. Fernet-Branca is known as “the bartender’s handshake,” because its powerful flavor is an industry greeting. When one bartender serves another, two shots of Fernet-Branca are usually poured on the house and raised in a toast. Oh, you don’t know about the challenge coin? Fernet-Branca ambassadors give out challenge coins to influential bartenders. The coins' designs are regional by market, and there is a rare one released for the company's 170-year anniversary. It works like this: when two or more coinbearers are out drinking, one of them lays her coin on the bar to call for a round of Fernet-Branca. Everyone else must do the same. If any persons present don't have their coin, they buy that round. If everyone presents coins, the challenger loses her bet and must pick up the round herself. There are rules. The coin must be within reach. It can’t be passed on, and "I lost it,” doesn't excuse you from playing. Once you’re in, you’re in (and you'd better hope your local rep replaces your lost one). And no, it’s not from a silver bottle, but that’s good, too. Fratelli Branca recommends drinking their product neat in three sips: the first is a challenge, the second an intrigue, the third is all pleasure. Notes of colombo, aloe, and gentian give the first sip its heat and bitterness. But with those still on your tongue, the second one gives way to the zedoary and chamomile, which lend the drink a spicy air of licorice. The third one, fulfillment, is bitter again, with the myrrh coming to the forefront. Slow sipping may explain why Fernet-Branca was sold legally during Prohibition. Its perceived medicinal value led drinkers to imbibe at a slower pace than other alcoholic beverages. That, combined with the drink's history as an elixir, made it seem less like a refreshment and helped circumvent the alcohol laws. In fact, you could get it in Italian pharmacies until the 1940s as a cure for night-sweats, cramps, and other ailments. What gives Fernet-Branca its bitter, minty flavor? Tough to say, chum, when it contains 27 natural “roots, plants, and flowers.” Fratelli Branca is surprisingly open about what those are. 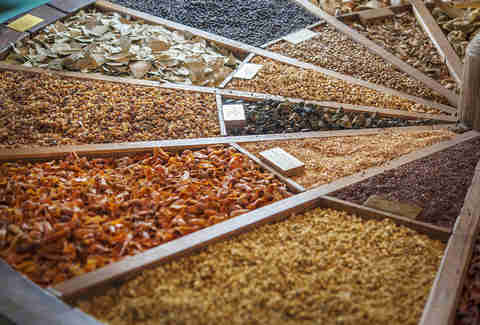 Its known ingredients are aloe ferox, gentian, saffron (the company buys so much of the world’s saffron that it actually affects the spice's market price), Chinese rhubarb, chamomile, galangal, myrrh, laurel, cinchona, zedoary, bitter orange, laraha, cardamom, cornflower, peppermint oil, juniper, bay leaf, angelica, colombo root, and orris root (derived from the iris flower). If you’re wondering about those remaining elements, they’re rumored to include linden, sage, gentian root, and St. John’s wort, but don’t get sad that you’re still a few ingredients short. Fernet-Branca could release the full list and your homemade batch would still be garbage: the proportions and production methods heavily affect the final flavor. In fact, the company keeps a collection of imitations produced by competitors on display in Milan, like a trophy case of relics from dead warriors who tried to claim the throne. Why did they even try to copy it? The real deal is right in front of you and far easier to acquire.